Chalkboard paint has become so popular and you can find it used in all areas of your home. I love it which is why I wanted to create a whole chalkboard series to feature all of my favorite ways I have seen it used from the kitchen to the office and even outdoors. 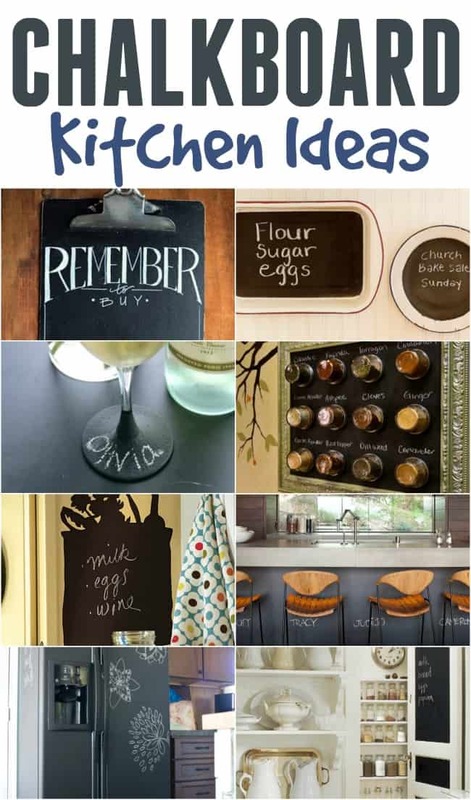 Today though I want to show you how to use chalkboard ideas in the kitchen. Maybe you don’t want to go as far as painting your fridge but how about trying out a door or even smaller steps like painting a few chargers to spice up your dining table. Nothing painted with chalkboard but I have a huge space near my desk that this would really be perfect. Thanks for sharing. With regular chalk I can’t write that great either but they have chalk pens which work a lot better if you are wanting to do those pretty designs. I’ve been wanting to do the wine glass thing for a while. I also really like the plate name cards. I know… I would love that too. So awesome and creative! My whole home could use some chalkboard inspiration! Thanks for sharing! Pinned!